precautions are in place in your business. provides suitable training for recommended employees. identified by the risk assessment. able to fulfil this requirement. writing an evacuation plan, fire drills and employee training. with fire safety law, employee duties and enforcement of the law. fire safety sign and fire action notices. ï‚· Be aware of the components and causes of fire. ï‚· Understand your duties in eliminating or reducing the risk of fire in the workplace. 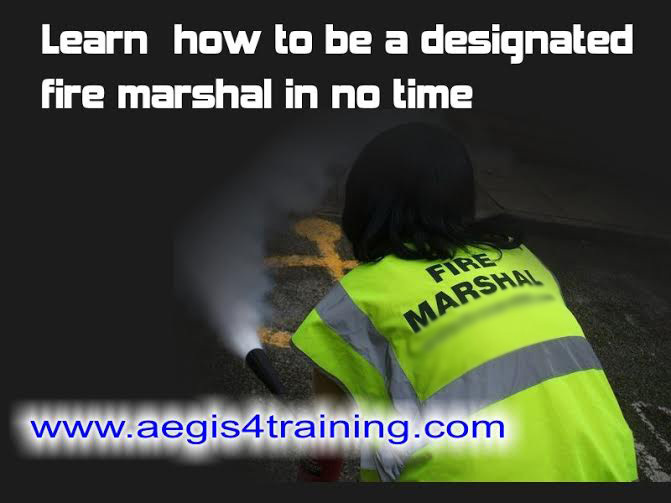 BUY OUR FIRE MARSHAL TRAINING COURSE NOW! I love what you wrote it gives me a lot of idea and concept.. More power to Aegis 4 Training Company!